At Colorado State University in Fort Collins, CO, Cody began his career on stage. His work at CSU garnered him several Irene Ryan Nominations, a departmental Best Actor award, and an award of Highest Distinction at the Research and Creative Symposium, for his self-created performance art. Cody helped foster and co-produced CSU Theatre Sports (now Clownbox Productions), still one of the most successful improv troupes in the Colorado. In addition to over 100 improv shows, some favorite Colorado performances include Shep in Café Theatre’s performance of Early One Evening at the Rainbow Bar and Grille, Gogo in Blackbox Theatre’s production of Waiting for Godot, Bo in Bas Bleu Theatre’s production of Bus Stop, and Snug in Openstage Theatre’s performance of A Midsummer Night’s Dream. In 2000, Cody left the Rocky Mountains to move to Chicago, where his big shoulders would blend in. His work as a trolley-driving tour guide gave him a crash-course in Chicago history, and allowed him to work his way through the famed Second City Conservatory. 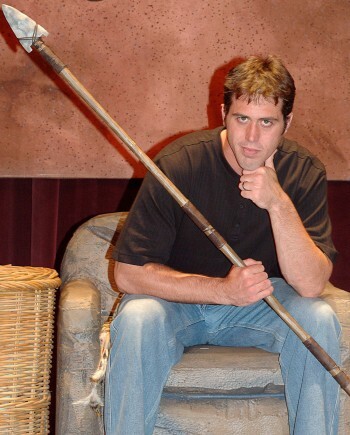 Cody was working professionally as an improviser and in children’s theatre when he joined Caveman in 2004. Some favorite Chicago productions include Dr. Matt Breen in The Free Associates’ improvised parody of ER called BS, Miles Ruleous in Hero Zero, and various roles in Boston Chamber Theatre’s National tour, Encore! Between Caveman performances, Cody is continuing to develop other aspects of his career, appearing in national commercials (Buffalo Wild Wings), voiceovers (Coors), and feature films (Eden Court). Cody also brews his own beer and builds saunas. He also enjoys Twizzlers; discount furniture, and most things Dutch. Cody would like to send his Thanks and Love to his family, who have always been supportive of his work: His mom and dad, the original hunter/gatherers, his brother Noah, a hip-hop neanderthal, and his sister Elly, redefining the goddess.